Native American Symbols, like the Fire symbol, can vary in meaning from one tribe to another and across the culture groups of North America. The Fire symbol was used by the ancient Native Americans of the Mississippian culture. Discover facts and information about the meanings of secret and mysterious symbols used by Native American Indians in our List of Symbols including the Fire symbol. Native American Indians were a deeply spiritual people and they communicated their history, thoughts, ideas and dreams from generation to generation through Symbols and Signs such as the Fire symbol. Native American symbols are geometric portrayals of celestial bodies, natural phenomena such as fire and animal designs. 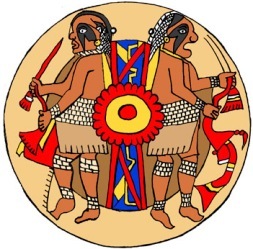 The Fire symbol featured in the ancient Mississippian culture of North America, the culture of the Mound Builders. The Mound Builders associated great mystical value to fire. The sacred rites, myths and symbols of the Mississippians play a role in the beliefs of many Native American tribes. Fire played an important in the traditions of Native Americans and was present in all ceremonies and rituals. Fire acts as a Messenger and is a gift from the Great Spirit. Smoke for the fire was used to cleanses sacred items, such as drums, shakers, pipes, before ceremonial use. Fire symbolized the heart of the People and its smoke, which could also be created in a pipe, carried prayers to the Great Spirit. The Fire Symbol represents cleansing and renewal because out of the ashes of a fire comes new growth and new thoughts and ideas. The meaning of the fire symbol is self explanatory but confusion arises due to identifying exactly what icon was used as the fire symbol. Traditionally the Native American symbol for fire was often combined with the symbols of the four elements. The individual elements of Air, Fire, Water and Earth are each represented by a circle. The symbols for the sun portrayed both light and warmth and were often represented in the sun symbols, which show the round fire circle representing warmth surrounded by rays indicating light. The Fire symbol was also represented in a pictogram by the Native American Indians as a Camp Fire symbol. The Fire symbol was therefore conveyed by various types of symbols. 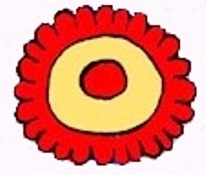 The following Mississippian circular sun symbol has been described as the earth's forces passing out of the body of the sun into the atmosphere. But logically it could equally be used as a fire symbol. In Cherokee mythology the water spider is said to have first brought fire to the inhabitants of the earth in the basket on her back. The Mississippian culture dates back to the ancient indigenous population of North America. Our grasp of Mississippian symbolism is only rudimentary. Their true meanings can never really be known and the meanings of the symbols are based on best guesses. Our conclusion and best guess is that this Mississippian symbol was possibly used as a fire symbol. The basic interpretation of the larger picture could well be brothers sharing the same hearth or fire. The most ancient Native American Indian symbols, like the Fire symbol, came from the Mississippian culture which was established in 1000AD and continued to 1550AD onward. The Mississippian Native Americans were the last of the mound-building cultures of North America in the Midwestern, Eastern, and Southeastern United States. 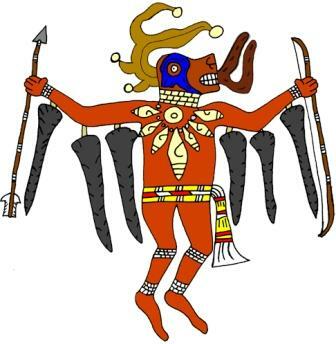 The Mississippian culture was based on warfare, which was represented by an array of emblems, motifs and symbols. The Mississippian culture warrior icons like the Fire symbol provides interesting history and ideas for tattoos that include cosmic imagery depicting animals, humans and mythical beasts. The Mississippian Native Americans practiced body painting, tattooing and piercing. For additional interesting facts and information about Native Americans refer to Making Fire. Native American Indians of the Mississippian culture were sun worshipers and had a highly complex warfare culture. Their symbols, such as the Fire symbol, reflect the warfare culture and the religious beliefs and cosmologies of the different historic tribes who existed at the time of the first European contact. The Mississippians believed that the universe consisted of three parts with good and bad spiritual forces. These three worlds were linked together and their connection was usually portrayed as a cedar tree or a striped pole. The Underworld was inhabited by spirit snakes, the Upper world was inhabited by spirit birds and the people of the earth who were ruled by these powerful spirits like the Fire. Items displaying symbols, like the Fire symbol, from the Mississippian culture have been found in burial sites that contained war axes, knives and other weapons. This type of symbol was embossed in valuable materials such as rare shells, copper and lead and depicted on pottery and stone tools and weapons. Fire. Discover the vast selection of pictures which relate to the History of Native Americans and illustrate many symbols used by American Indians. The pictures show the clothing, war paint, weapons and decorations of various Native Indian tribes that can be used as a really useful educational history resource for kids and children of all ages. We have included pictures and videos to accompany the main topic of this section - Fire. The videos enable fast access to the images, paintings and pictures together with information and many historical facts. All of the articles and pages can be accessed via the Native Indian Tribes Index - a great educational resource for kids.